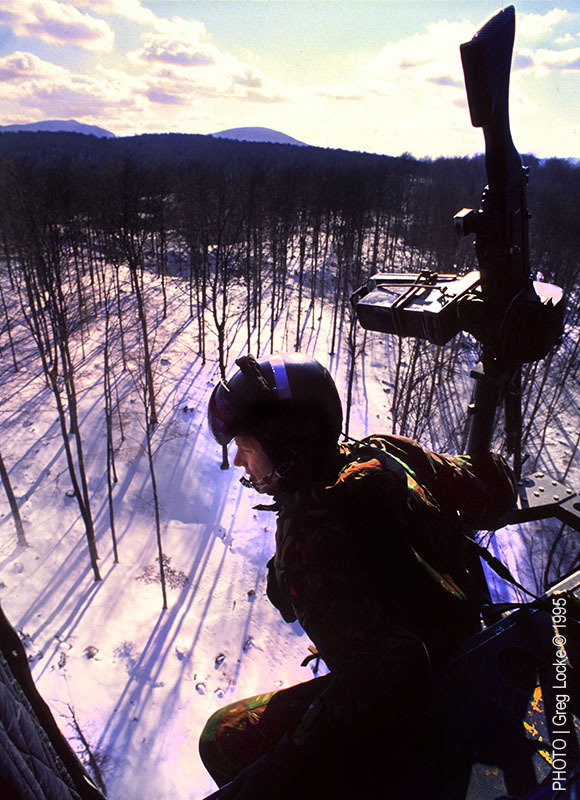 A British army helicopter serving with IFOR searches for mass graves near the town of Srebrenica, Bosnia in the winter of 1996. Photo by Greg Locke © 1996 Copyright. SARAJEVO (Reuters) – A metal capsule containing over 20,000 wishes for the future was stored away in a Sarajevo museum on Saturday to mark the 20th anniversary of the peace deal that ended the Bosnian war but left the country deeply divided and dysfunctional. The anniversary passed with little fanfare for an accord that has kept the peace for two decades, but at the price of a state carved up along ethnic lines and still hostage to nationalism. “I will not allow the past to ruin our future,” Armin, a 21-year-old man, wrote in one of the messages collected across Bosnia for the time capsule in the national museum, an initiative sponsored by the U.S. government development Agency (USAID). Hammered out at a U.S. air base in Dayton, Ohio, the accord brought to an end more than three years of war between Serbs, Croats and Bosniak, in which some 100,000 people died, the majority of them Muslim Bosniaks. It divided Bosnia into two autonomous entities, the Serb Republic and the mainly Bosniak-Croat Federation, and created a highly decentralised and unwieldy system of ethnic quotas. The arrangement silenced the guns ever since, but is blamed by many in Bosnia for stifling integration and development, and perpetuating wartime divisions. Despite two decades of peace and billions of dollars in foreign aid, nationalist parties still hold power and, observers say, have not changed their wartime goals. The mainly Muslim Bosniaks want to centralise the state, many Croats still dream of their own entity, while the Serbs fiercely resist any attempt to streamline the state and frequently threaten secession. Critics say the system has encouraged corruption and slowed reforms to address rampant unemployment. “In the next 20 years, I want to be able to find a job with a graduate diploma,” read another wish, by 21-year-old Adnan. The time capsule will be reopened in 2035. Concerned over rising frustrations, particularly among Bosnia’s youth, the West is trying to encourage change within the framework of Dayton by dangling the distant prospect of Bosnia one day joining the European Union. The country’s peace overseer, a foreign envoy charged with ensuring Dayton is respected, urged Bosnia’s leaders to “refresh and rediscover their vision” for the future. “People rightly want more than just peace,” Austrian diplomat Valentin Inzko said. Dayton’s three signatories – Bosnian leader Alija Izetbegovic and the presidents of Serbia and Croatia, Slobodan Milosevic and Franjo Tudjman – have all since died. Serbia and Croatia both helped foment the fighting. Izetbegovic’s son, Bakir, the Bosniak member of the Bosnia’s tripartite, rotating presidency, was present at Saturday’s ceremony, unlike his Serb and Croat colleagues, who were abroad at the time. “With new people and new approaches, the Dayton peace agreement will be different and better,” said Izetbegovic. “Dayton is the rock around which the stability of this country is built and that rock should stay in place, but it’s what we build on that rock that matters,” he said earlier this month. In Srebrenica, digging for the dead and fighting denial 20 years later, By Daria Sito-Sucic and Maja Zuvela, Reuters July, 2015. A Dutch civil court in the Hague ruled that the relatives of some 300 men and boys killed after being evicted by Dutch peacekeepers from the Potočari compound could receive compensation from the Dutch state. Facts and Opinions is a boutique journal, of reporting and analysis in words and images, without borders. Independent, non-partisan and employee-owned, F&O is funded by you, our readers. We do not carry advertising or “branded content,” or solicit donations from partisan organizations. Thank you for your patronage, and please tell others about us. Most of our pages are not behind a paywall. To help us continue, we suggest a minimum payment of .27 for one story, or for use of the entire site at least $1 for a day pass, and $20 for a year. Please visit our Subscribe page for details, or donate below. With enough supporters paying a small amount, we will continue, and increase our ability to offer original works.